November 3, 1858 a goodly number of Masons met in a cabin on Cherry Creek in Denver to start the first Lodge of Freemasonry in Colorado. 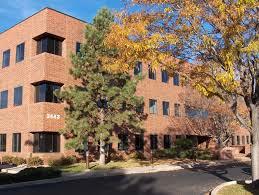 They contributed to the founding of the City of Denver and building of its character. 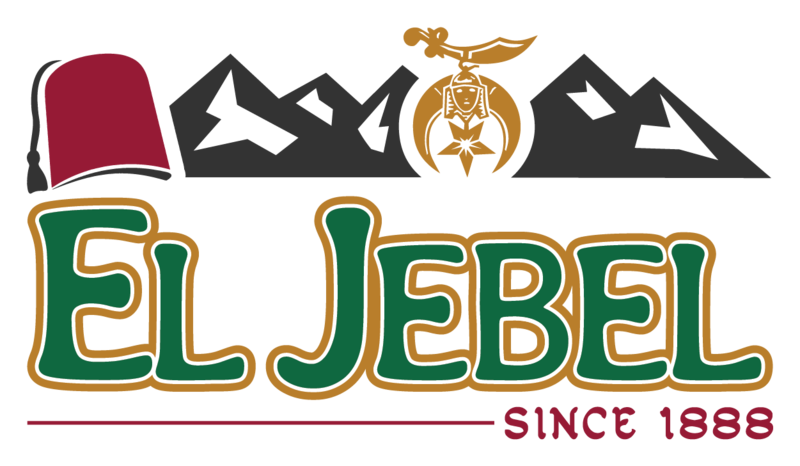 Thirty years later, EL JEBEL SHRINE was chartered, and has contributed color, spirit and a fine balance of fun and philanthropy. 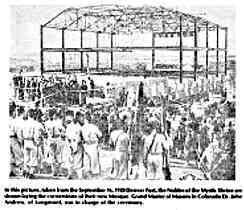 September 23,1887, ISIS Shrine, Salina, Kansas, created forty Nobles in the first Colorado Shrine ceremonial in “the old room” over the Denver Fire Station at 14th and Larimer. 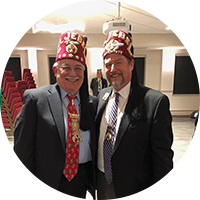 Denver’s first Nobility, under ISIS Shrine guidance, chose GEORGE Q. RICHMOND as Potentate U.D. ALBERT B. McGAFFEY was elected Potentate for 1888 and 1889. He was a leading light in EL JEBEL history serving as Imperial Potentate in 1897 and as our Imperial Representative for four decades. Also in that first big year,1888, EL JEBEL made its first pilgrimage to Salt Lake City to confer work on a new Shrine Temple, El Kalah. In July 1894, Denver hosted the Imperial Shrine convention, attracting 1000 out of 31,000 Shiners in the Nation. 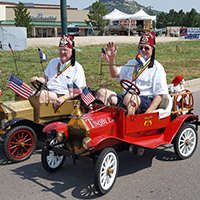 For the first three years the Nobility met over the Fire Station, then for 17 years at the Masonic Lodge. 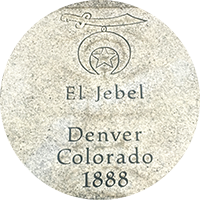 At this first Denver Shrine meeting MORTIMER J. LAWRENCE suggested the name, EL JEBEL, which is Arabic for “The Mountain”. These Nobles applied to the Imperial Shrine for a Dispensation which was granted December 1,1887. The Charter for the thirty ninth Shrine Temple was issued to EL JEBEL SHRINE on June 25,1888. Next came our First Mosque. 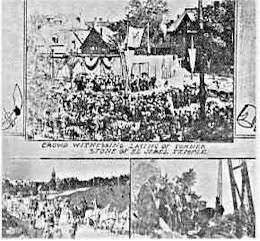 In elaborate auspicious ceremonies the cornerstone was laid in 1906. The new Mosque at 18th & Sherman was dedicated November 1,1907. The building was later sold and became the Rocky Mountain Consistory. 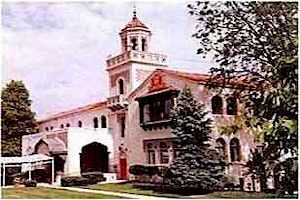 More room was needed for its 5,500 Nobles, so EL JEBEL purchased the defaulting Rocky Mountain Country Club with 193 acres at 50th and Vrain in Denver, Colorado. 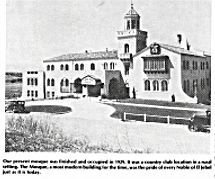 The Great Depression of 1929 took its toll on our Nobles and in 1936 EL JEBEL was forced to sell the golf course to the City of Denver to pay off the Mosque and to retain the Shrine. Our Shrine has continued to grow. 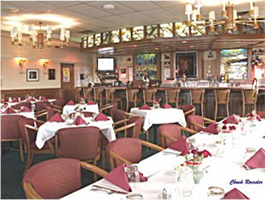 In 1982 we added an “OASIS” , a place for food and drink with a splendid view of the Rocky Mountains. Our Mosque stands as one of the most beautiful structures in Denver.